Uninterruptable operations require dependable and efficient solutions. Corporations, Hospitals and School districts require critical reliability for continuity and to profit through client commitments, health care providers must instantly care for their patients and government agencies protect the public during emergencies – all in safe, secure environments. Reliability, flexibility and energy efficiency are project goals that require experience, understanding and AEG’s holistic approach to engineering solutions. 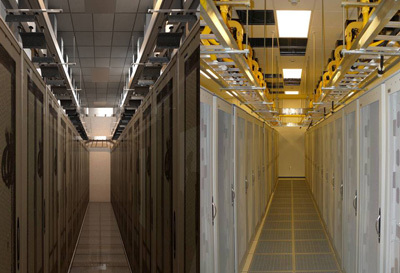 3D Revit models of a Socorro ISD datacenter (left) show considerable detail for user review, prior construction. The finished project (right) is functioning well for a major financial services client. By identifying the user groups’ expectations and needs for disaster recovery, early in the process, AEG engineers facilities that accommodate immediate needs and are flexible to provide for future growth. Regardless of your facility location and climate, we analyze options to achieve energy efficient and reliable, redundant operations, with demonstrated success at all Tier levels. Let AEG’s experienced engineer’s team develop a plan for your future critical operations. Contact us today to request a project proposal or schedule an appointment. SUNLIGTH FEDEAL CREDIT UNION SERVER ROOM UPGRADES.